Wow. Beautifully made. The cinematography is brilliant! All the performance art, photos, tricks, architecture and everything else are just amazing. I have to admit that I didn't get the whole message, I think I should watch this film again when I get 65 years old and only then I will totally understand the whole thing. Italy certainly is beautiful, and every frame featuring Toni Servillo's marvelously expressive face is a pleasure to watch, particularly when he spouts his cynical wisdom. That said, this movie is longer than it needed to be, and the satire takes aim at some pretty easy targets. That's as good as I can begin writing this review. 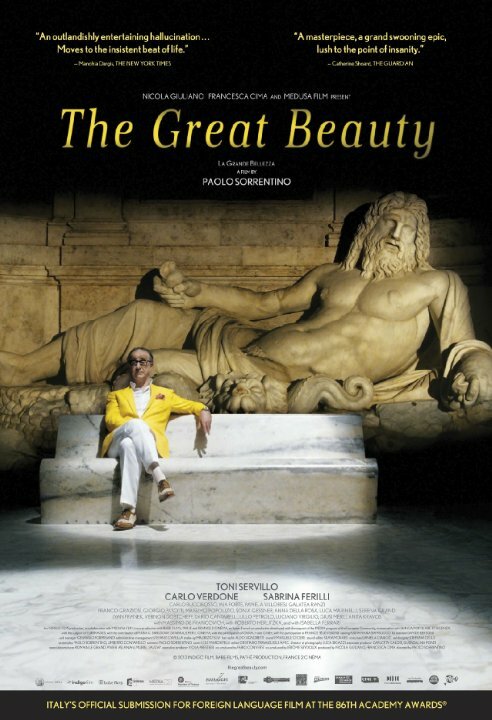 La grande bellezza starts as a beautiful film of insane proportions, which leads to the imminent question: What is this about and why is it showing us the things it is showing? It's beautiful in a sense that it is ever-changing and eventful. Like a movie looking for something. Colors are often muted or accentuated, surreal images are shown to contrast with the rather down-to-earth mentality displayed through the excellent framing and cinematography. For the first hour or so I was very invested in the visuals and very self-critical, bombastic style that the film had. I like films that explode into dialogue at points, but also have their quiet moments. No posts have been made on this movie yet. Be the first to start talking about Great Beauty, The ( grande bellezza, La )!